Child Development 9 Edition A best-selling, topically organized child development text, Berk’s Child Development is relied on in classrooms worldwide for its clear, engaging writing style, exceptional cross-cultural and multi-cultural focus, rich examples, and long-standing commitment to presenting the most up-to-date scholarship while also offering students research-based, practical applications that they can relate to their personal and professional lives. Berk takes an integrated approach to presenting development in the physical, cognitive, emotional, and social domains; emphasizes the complex interchanges between heredity and environment; and provides exceptional attention to culture. Laura Berk, renowned professor and researcher, presents the latest theories and findings in the field to students in a manageable and relevant way. Berk’s signature storytelling style invites students to actively learn beside the text’s “characters,” who experience real issues in development, including physical, cognitive, and peer challenges, as well as parenting and educational concerns. Berk also helps students connect their learning to their personal and professional areas of interest. Her voice comes through when speaking directly about issues students will face in their future pursuits as parents, educators, heath care providers, social workers, and researchers. As members of a global and diverse human community, students are called on to intelligently approach the responsibility of understanding and responding to the needs and concerns of children. While carefully considering the complexities of child development, Berk presents classic and emerging theories in an especially clear, engaging writing style, with a multitude of research-based, real-world, and cross-cultural examples. 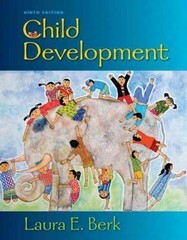 Strengthening the connections among developmental domains and among theory, research, and applications, this edition's extensive revision brings forth the most recent scholarship, representing the changing field of child development. Note: MyDevelopmentLab does not come automatically packaged with this text. To purchase MyDevelopmentLab, please visit: www.mydevelopmentlab.com.